That blessing was my prayer for you in 2007. Today, I want to give you my prayer for you in 2008. It is the Apostle Paul’s final prayer for the Corinthian church to whom he has written a very personal and powerful letter. This prayer comes in the form of a benediction. “Bene” is the Latin for good, and “diction” means word, so a benediction is a good-word spoken over you. A blessing. A prayer that is spoken over someone. And this benediction blessing is not just some nice words tacked onto the end of a long letter. These words express an unbelievable spiritual reality that Paul desired for the Corinthian church and that I desire for you in 2008. The first thing I want you to notice is the last word in the verse. Paul’s prayer request, Paul’s blessing, Paul’s benediction was for each and every believer at Corinth to experience the blessings of this prayer. And it is my prayer for each and every one of you, as well. It is my prayer for those who are too young to understand what I’m saying right now. It is my prayer for Haley Woodling, Keagan Dobo, and Katelyn Hurley. It is also my prayer for pre-schoolers who could grasp each of these words–many of whom are back in our excellent children’s church program right now. It is also my prayer for grade school students. And for junior highers. And for senior high students and for graduates. I hope you’re listening. It is my prayer for those who are getting started with college or jobs or families. And for those who have things underway. For those who are in their 30's and 40's. For those who are married and for those who are single, unmarried, widowed, divorced. It is my prayer for you if your kids have left the nest (or should have by now!). Or if your kids died early. Or you never had any kids. This is my prayer for you in 2008 for those who are taking care of their parents. For those who are retiring or wishing they were. For those who are “senior saints” getting up in years. On my meals on wheels route, there is a precious lady who tells me that “There’s nothing golden about the golden years!” Well, this is gold, and I’m praying it for you! This is my prayer for you who are soon to pass from this life to the next. This is my prayer for you, as your pastor in 2008. And it is for ALL. The second thing I want you to see is the Trinitarian nature of this prayer. Paul includes a prayer for something from the Son of God (“The Lord Jesus Christ”) and from God the Father, (I think that’s Whom is being referenced as loving. When there is no modifier, I think that most references to God are God the Father), and the clincher is the last, God the Holy Spirit. Paul’s prayer is for the fullest blessing of the blessed Trinity to be with all of the believers at Corinth. You know, we don’t talk enough about the Trinity. There is only one God. And, yet, He exists in three persons, the Father, the Son, and the Holy Spirit. Three in One. One in Three. One God perfect in every way. Three persons each sharing the fullness of the divine nature yet distinct in personhood, relationship with each other, and distinctive roles. I’ve been reading an excellent little book about the Trinity that I highly recommend. Anyone here with a high-school education could read this book, and most of our teens could, too. It’ll take little bit of thinking, but that’s the point, isn’t it? I highly recommend it to you. Bruce Ware, one of my old professors at Trinity, now an associate dean at the Southern Baptist Seminary in Louisville, Kentucky: Father, Son, & Holy Spirit: Relationships, Roles, and Relevance. This is not a dry piece of theology. It is very relevant to our lives! The Trinity is very relevant to our lives! Paul knew that, and that’s why he prays this way. I almost titled this message: “Experiencing the Trinity” because that’s what Paul wants for these believers. He wants them to have the full experience of the full blessing of God in Three Persons, the Blessed Trinity! Let’s take each part of that one at a time. My Prayer for You #1. MAY THE GRACE OF THE LORD JESUS CHRIST BE WITH YOU. I pray that you would experience the grace of the Lord Jesus Christ. Grace is unmerited favor. It is unearned blessing. Grace is not getting what I deserve and getting what I don’t deserve! Grace is God’s blessing on the undeserving. And I pray it for you! We need grace. We need God’s blessing. And we are undeserving! We can’t earn it. We can’t be worthy of it. But we desperately need it. We need grace. And we’ll need more grace in 2008! But we don’t deserve it. The Bible says that we deserve condemnation. We have earned for ourselves God’s wrath and not His good pleasure. That’s why Paul says that he prays for the grace of...the Lord Jesus Christ! Because Jesus died to give us grace. The whole point of the Cross is the unleashing of grace on God’s people. One definition of grace is God’s Riches At Christ’s Expense. My prayer for you in 2008 is that you would experience the grace of the Lord Jesus Christ. The grace that comes through the Cross. This is especially my prayer for you if you have not yet come to know Jesus Christ as your own Lord and your own Savior. Your own King and your own Rescuer! I’ll tell you a secret. Some of your names are written on these little piece of orange paper in this Fish Bowl. If you are not yet a faith-follower of Jesus Christ, having trusted in Him alone and what He did on the Cross for you, then we are praying for you that 2008 would be the year. The year that you turned from your own way and trusted in the Way, Jesus. The year that you left whatever unbiblical belief system you have been clinging to and rested in full reliance upon the Truth, Jesus. The year that you walked away from an empty way of life and began a new Life in Jesus Christ. He is the Way, the Truth, and the Life! And I pray that you would experience the grace of the Lord Jesus Christ! Freedom from Sin, Self, and Satan! Fresh, new, abundant life in Jesus. Not because you deserve it, because you certainly do not. But because of the Cross. Because Jesus hung there and died. Because of the grace of our Lord Jesus Christ. But this prayer is not just for those who are not yet believers. This is a prayer for ALL. So, there is more to the grace of the Lord Jesus Christ than just simple saving grace. There is also sanctifying grace. That’s the grace that comes to us and helps us to live holy lives. Set apart. Sanctifying grace. And there is also strengthening grace. The grace to go on. The grace to persevere. The grace to hang on and hold on through the tough times that 2008 will probably bring. That grace comes to us through Jesus, as well! And I pray it for you. That you would grow in the sanctifying grace and knowledge of our Lord Jesus Christ. That 2008 would be the best year so far for you as a Christ-follower. And that you would experience the strengthening grace of the Lord Jesus Christ–no matter what 2008 has in store. My prayer for you is that the grace of the Lord Jesus Christ will be with you all. And there’s more! That would be enough. But there’s more! My Prayer For You #2. MAY THE LOVE OF GOD THE FATHER BE WITH YOU. I pray that the love of God would be with you. That you would experience in 2008 an overwhelming sense of the unbelievable love of God...for you! God loves the whole world. He loves it enough to send rain on the just and unjust. And He loves it enough to send His own Son so that whoever believes in Him will not perish but have everlasting life. But do you know that God loves...you? If you have come to believe the gospel and put your faith in Jesus Christ, then you can know that God loves...you! #1. The Cross. God did the Cross out of love for you. The grace of the Lord Jesus Christ comes from the love of God the Father. I have 3 sons. I don’t think I would give one of them for you. It would take a lot more love that I yet have in my heart. God loved you enough to give His Son. #2. The Father’s Love for His Son. This is how much God loves you: How much does He love His Son? Remember what God said when Jesus was baptized? Do you know that God sees you in His Son, through His Son? He loves you, with the love that He has for His Son! I want you to know that, feel that, and experience that in 2008. I want you to know that you are loved with a unbelievably great love! If my preaching and teaching does not lead you into that love there is something wrong with my preaching and teaching. My prayer for you in 2008 is that the love of God the Father will be with you all. My Prayer for You #3. MAY THE FELLOWSHIP OF THE HOLY SPIRIT BE WITH YOU. Now that word “fellowship” doesn’t mean doughnuts and coffee. Sometimes we use it that way. “Let’s have some fellowship” means lets have some food! And of course, food is a great way to have fellowship. That’s why we use the phrase table “fellowship,” meaning sharing food together and sharing together over food. But the word “fellowship” basically means a partnership. It means something shared between two or more people. It means togetherness in something, some cause, some item, some person that binds people together. That’s fellowship. We often use the word “relationship” to get at this closeness, this togetherness. Well, Paul prays that the Corinthian believers would not just experience the grace of the Lord Jesus Christ, and the love of God, but also the fellowship of the Holy Spirit. I think that means that they would experience a close relationship to God through God’s Empowering Presence in the person of the Holy Spirit. That these believers would experience communion with God. Direct communion with God through the Spirit. Now, I could go on an on about that! In fact, I’m going to for the next few months! I think it’s time for us to concentrate our minds on the Bible’s teaching about the Spirit and His work among us so that we can better experience Him at work in our lives. I invite you to come every Sunday for the next 2 or 3 months as we think deeply about God the Spirit and His mysterious ministry among us. And I pray that you would experience Him in living relationship. May the fellowship of the Holy Spirit be with you. It may also be that Paul had in mind a little bit of a different fellowship here, as well. The fellowship of believers because of the Holy Spirit. The context might point to that because of Paul’s desire for unity among the believers. The Holy Spirit is Who creates the church. We wouldn’t be able to have our fellowship here at this meeting, or that the dinner to follow, or at the meeting after that if it wasn’t for Him. I am very thankful for our fellowship as a church. This Wednesday, right about quitting time, I had some visitors drop in from the Interstate. They were trying to get from Florida to Texas to Indiana to New York City and they had run out of money. Their names were Lance, JaTon, Fred, and Lindsey. And JaTon was pregnant with a little girl named Justice. Heather and I decided to bring them home and give them a home-cooked meal and offer them a place to stay for the night. The kids enjoyed playing with them. And then when it was time to leave, they backed up into the yard and their car wheel fell into a hole that the kids have dug in the front yard! We had to get out and push them out of the hole. I invited them to come with us to church. They were followers of Christ, as well. And, so, we were family! And I knew how you folks would treat them. I knew that you would take them in as family. They were different than many of us are. They looked different. They talked a little different. They hadn’t made good plans or acted wisely in figuring out how to get from here to there. Fred didn’t even have a winter coat! But we could experience the fellowship of the Holy Spirit together. And I had every confidence that you love them with the Love of the Father. You know why, because I know that you are full of the grace of our Lord Jesus Christ! Thanks for being that kind of a church! My Prayer for You is that you would grow even deeper in that kind of grace, love, and fellowship. And that you would experience the fullest blessing of the blessed Trinity! Thank you for allowing me to serve you as your pastor. We are nearing a decade of fruitful partnership between flock and shepherd that has been a joy and a great privilege. I am thankful for you! I am also thankful for the other elected and appointed leaders that have served you faithfully this last year. I’m especially grateful for the 2007 Leadership Board chaired by Tom Hampton and our dedicated part-time staff, Holly Lockwood and Cindy Green. It has been a joy to work shoulder-to-shoulder with them. WHO WAS HERE IN 2007? 2007 was full of comings and goings. We took in eight new members: Jeff & Nancie Banghart, Curt & Pat McKnight, John & Marilynn Kristofits, and Bob & Lois Owens. But we said goodbye to 14 former members (some who had been gone for some time but had not changed their membership status). We also had several regular attenders leave the area for new jobs. This affected our attendance. The average weekly attendance for 2007 was 123.5 people (down about 4 people on average each week from 2006). We also had new people coming all Fall, so many, in fact, that it’s hard to keep track of everyone who needs assimilated! We also welcomed new babies and baptized five believers at the end of year: Abbi Houston, Emigh Modzel, Nathan and Lucas Kristofits, and Kay Knaul. By God’s grace, LEFC is a dynamic body of believers growing as disciples of Jesus Christ. WHAT WAS NEW IN 2007? Though most of what we did this year was the every-day, every-week, faithful “meat and potatoes” of ministry, there were a number of new dishes that God served us. • Each of our Leadership Board Members gave their testimony in the Worship Service. This was an encouraging time for the whole church family and helped many people to get to know our leaders better. • We changed the time of our Worship Celebrations and Sunday School to 9:00am and 10:00am in hopes of serving our church families and community better. • Our website: lansefree.org was revised and updated with a new look. In 2008, we hope to add “podcasting” of recent sermons so that people can download and listen to them directly from the website. • Our women’s ministry held a Ladies’ Spring Banquet and started a Secret Sisters Ministry to encourage each other during the year. • Our new Connection Team began its ministry of linking our church family together in closer fellowship. • Our sister-church plant, Crew Community Church led by Pastor Josh Perry, donated a video projector for us to use in ministry. • We had a missions mobilizer, Roger Dorris, present a special seminar weekend on short-term missions. We’re hopeful that this will be a stimulus for a growing ministry of short-term teams from our church. • We celebrated 115 years of God’s faithfulness to us as a church and had a special visit from former Pastor Jack Kelly & his wife Cheryl. WHAT DID I DO IN 2007? My definition of pastoral ministry involves three primary functions: Preach the Word, Equip the Saints, and Shepherd the Flock. I try to focus my ministry efforts in ways that fit into one of those prioritized categories. We had only two sermon series this year. For most of the year, we journeyed with Israel from Mount Sinai to the Jordan River. Numbers: Life in the Wilderness was the third series in a multi-year effort (on odd-numbered years) to Big Story of the Old Testament. I think we were happily surprised to find out how applicable those obscure stories and censuses really are! This Fall, I preached on Real Christians. This series was an attempt to go “back-to-the-basics” of the Christian life and make sure that each of us are genuine Christ-followers. I also got to represent you as the guest preacher in several different churches this year. I spoke at our sister EFCA churches CORE Community Church in Shelby, Ohio and Crossroads Community Church in Duncansville, PA, as well as, First Baptist Church of Philipsburg. And in our own community, I was the speaker at the 2007 West Branch Community Thanksgiving Eve Service. On the few occasions that I was out of the pulpit, you were aptly served by Tim McGill, Jim Culbertson, Josh Perry, Jeff Powell, Blair Murray, Wally Kephart, Tom Hampton, Ralph Magill, and Bruce Weatherly. We are going to begin 2008 with a series on the ministry of the Holy Spirit. Pray for wise preparation for me and open hearts for our church family! A large portion of my time is spent working with leaders, ministries, and committees to effectively serve the church family. As you read the other reports in this Annual Report, you will see the fruit of their labors, and I’m glad to provide resources, support, encouragement, and leadership to them. Ministering directly to people is one of my favorite things about my calling to be a pastor. I love visitation, counseling, and hospitality. We had many of you in our homes, and many of you invited me (and sometimes our whole family!) into your home this year. It is a privilege to be a part of your lives in times of celebration and sickness, birth and deaths, and other major and minor events. Thank you for including us in your lives! This last Summer, the Leadership Board granted me a three week mini-sabbatical to refresh and refocus for ministry. I spent most of the time re-organizing my office for peace of mind and better efficiency. I gave away 250 books, threw away two 30 gallon trash-bags full of paper, and deleted 5,000 emails! I was also able to be home with my family almost every night for 3 weeks (that never happens!). And I was able to give my wife a few “breathers,” including a 24 hour personal retreat and a planning day for Fall homeschooling. It was a truly great time and a gift to my family that came just the right time, as both my grandfather and Heather’s grandmother had recently died and we were experiencing the strong effects of personal grief. My mini-sabbatical was also a time for me to set some new life-goals for myself including losing 50 pounds and regaining cardiovascular strength. I even topped it off by shaving off a decade-old beard! Strangely enough, however, the most major change for me and my ministry came, not during my mini-sabbatical, but at the annual Pastors & Wives Retreat in late September. It was there that God spoke very clearly to my heart that I have been failing to effectively lead our church with vision and perseverance because of personal fears and laziness. I was “laid low” by this realization, but came to repent of these sins and re-commit myself to leading you with vision and love. I have made several changes to my lifestyle and ministry since October (including a monthly personal prayer retreat day) and have a number to go. Heather and I really appreciate your prayers for us as a family and your many expressions of love and appreciation throughout the year. It is a joy to be your pastor! HOW DID WE DO ON OUR 2007 GOALS? At the beginning of last year, we set out 4 new areas of goals to REACH for. Our Connection Team began in 2007 to enhance fellowship connections between participants in Lanse Free Church. Connection Team members are providing a personal touch to a group of people (both established families and families needing assimilated) and passing on vital information to the leadership (Ephesians 4:16). The Connection Team is like a “nervous system” for the Body of Christ at LEFC. While this team (along with our hospitality and deaconess teams) have already helped us in the area of fellowship, the Connection Team still needs at least 2-3 more couples or singles to really function effectively. We have a number of new people at LEFC, and we really need to work hard to make sure everyone is included in the community life of the church. Another key In-Reach goal was for the Leadership Board is to come to a resolution and direction concerning some suggested changes to our leadership structure. Our board has been working diligently on this and has some new directions to present at this Annual Reports meeting. I think we made some significant strides in this area in 2007. We got outside of our “four walls” again with an Outreach Booth for the West Branch Community Days. I wrote articles for EFCA Today on reaching our “Samaria” and a book-review of The Externally Focused Church. For me personally, one of the upshots of this focus has been a new ministry for me–participating in Meals on Wheels on Thursdays–trying to reach the last, the least, and the lost. We grew in prayer for the lost by putting out a Fish Bowl with the names of unsaved folks that we are praying to trust in Jesus. We still need to keep praying for a strong gospel-centered church to be birthed in Philipsburg! I think one of the most amazing things God did among us in 2007 was down-size our debt. We paid off around $30,000 on our line-of-credit and got our cash-flow back on a reasonable basis again! You folks “reached down” into your pockets and gave cheerfully–and without making it a “focus”– saw God basically eliminate our indebtedness! Praise God from Whom all blessing flow! Prayer continued to be a major emphasis for Lanse Free Church. I know that our people pray, and while we didn’t see everything happen that we asked for, I know that God answered our prayers this year with His unbelievable wisdom, power, and love. WHAT IS AHEAD FOR 2008? 1. We’re praying and working towards establishing 5 Active Link Groups by June 2008. A Link Group is two or more people associated with Lanse Evangelical Free Church who are primarily led by a commissioned Link Group Leader and meet together at least once a month for the purpose of spiritual growth in biblical community. We have 2 active Link Groups now and want to see at least 3 more in place by June. Are you in a Link Group? 2. We’re praying and working towards holding 2 Servant Outreach Events by June 2008. A Servant Outreach is when we go OUT into our community and serve people in Jesus’ name and build bridges for the gospel. We believe that good works build good will for the good news. To get these outreaches going, we’ve established an Outreach Ideas Team whose job is to come up with ideas for Servant Outreaches (big or small) and help us to implement them. Would you like to join the Outreach Ideas Team? 3. We are praying and working towards an Allegheny District Church Planting Prayer and Support Team with 30 adults praying and raising $300/month. We are serving as a guinea pig for this initiative to pray for and fund church planting throughout our District (the district goal is 1,000 praying people and $120,000). So far already, we have 20 adults praying and more than $300 per month has been coming in! Praise God! Is God calling you to join the Prayer & Support Team? 4. We are praying and working towards Totally Eliminating Our Debt. With just a little over $3,000 to go, this goal is right within our reach! 5. We are praying and working towards Developing a Master-Plan for the Next Three Years. We are hoping to get every leader and ministry involved in developing vision, goals, and plans for furthering the ministry here at Lanse. We want to make sure that we are ready for the future that God has for us. I am hopeful that by next year’s Annual Report, we have a comprehensive plan in place and operating, a plan that is Cross-Centered, Prayer-Driven, and full of Vision. 6. We are praying and working towards a Leadership Restructuring Completed and Approved by June 2008. As I mentioned above, we have been working on this for around 3 years and now have some specific proposals to work through with the whole church family. I am hopeful that we can have all of the changes proposed by our April meeting and ready to be put into effect by June or July. I think these will significantly help us to grow into the church God wants us to be. It’s important for us to make goals. And even more important for us to allow the Lord to lead us every step of the way. “The horse is made ready for the day of battle, but victory rests with the LORD” (Proverbs 21:31). I don’t know exactly what the future holds, but I know that God has good things in store for us! I’m hoping to work alongside you in ministry for the next decade! “May the grace of the Lord Jesus Christ, and the love of God, and the fellowship of the Holy Spirit be with you all” (2 Corinthians 13:14). Read his thoughts about The Goof on the Roof and the State of Contemporary Masculinity. So much of our culture's problem with biblical manhood is that they have not seen it in action! Paul Tripp trip wonders at answered prayer and gives 5 biblical reasons for it. For many years now, John Piper has taken 1 Sunday a year to focus on race and ethnicity and grace and Christ. He always does it around MLK day. Like many things that Pastor Piper does, I have been very challenged and encouraged by this practice. This year's message, Probability, Prejudice, and Christ, shows the distinction between generalizing and racism by thinking about Nathaniel's view of Nazareth in John 1:43-51. Recommended reading. RCO has a great list. The 3 wise men were overseen by their heaven-sent sister (halo-ed one on the left). Here they are! 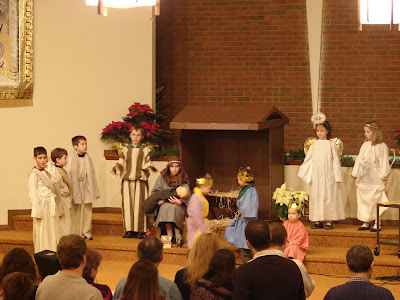 The 3 PA Mitchell boys as the 3 Wise Men in the 2007 Christmas Program. John Piper reflects on his father and how he now has the mantle of family patriarch. I was struck by his desire to pray for his family and convicted to learn to do the same. Next Sunday, we’re going to have a special guest preacher, Pastor Brian Rathbun. Brian is going to speak at our Wild Game Dinner on Saturday night and then again here on Sunday morning. I think we’re really going to enjoy getting to spend this time with Brian. He’s a lot of fun and really loves the Lord. Then the next Sunday, January 27th, I hope to start our Winter/Spring sermon series which is going to be on the person and ministry of the Holy Spirit. That’s in two weeks. Dan Kerlin, Roper Houston and I teach a Youth Boys class on Wednesday nights. And there are like 17 boys signed up for that class. And each week, we have been memorizing a Proverb and talking about what it means for our lives today. The Proverbs are jam-packed with wisdom for skillfully living in this world, and we’ve been having a great time talking about them on Wednesday nights. Well, in Proverbs chapter 26, there is a lot there about fools. Proverbs basically divides people up into two categories, the wise and the foolish. There are other fine ways to slice it, but those two categories carry a lot of weight in the Proverbs. Wise and Foolish. The wise live by God’s word and make skillful, right choices in various situations–and because of that, they are blessed. That is, being foolish doesn’t mean being “silly.” It means being morally dull. Unwise. Picking the wrong things. Rejecting God’s truth as the guide for living. The fool consistently makes wrong choices. Not just mistakes but bad choices. And the Proverbs, especially chapter 26, teach both (how to be wise) that is, how not be a fool and also how to relate to those who are unwise–how to relate to those who are foolish. Verses 4 and 5 are two proverbs about how to relate to a fool. And they seem, on the face of it, contradictory. In fact, someone who doesn’t believe the Bible might point to these verses as an example of how the Bible is supposedly full of errors. But that’s foolish itself, because the compilers of the Proverbs were no dummies, and they put these two verses right beside each other! These verses are right next to each other to be provocative and to get us to think. And if we do, then we’ll be come wise in how to relate to those who are not. Let’s read these two verses together, pray, and then talk about what they mean. Proverbs chapter 26, verses 4 and 5. Let me give you a few fer’instances. Ladies, this is Sanctity of Human Life Sunday. You have a friend or a family member who just found out that she’s pregnant. And their boyfriend is pressuring them to get an abortion. The boyfriend doesn’t want the responsibility of a baby. And somehow you’ve gotten dragged into the discussion. You say that you think that abortion is wrong–all the time. And that she should keep the baby–anything else would be unthinkable. In all three of these situations you are dealing with a fool. How, if at all, are you going to answer them or any of the foolish things that you are going to actually encounter this week? Don’t start with his or her presuppositions. Don’t mimic his or her attitudes. If they come at you with foolishness, don’t answer back with more foolishness! Because, if you do, you’ll become like them. You’ll become a fool. And it just gets louder?! It’s better sometimes to say absolutely nothing. Young David made this mistake. David, before he was king, and his men were providing some protection to some neighbors’ property and they asked their neighbor for some reward–financial and nutritional as a payback. But this neighbor’s name was [anybody know?] Nabal. Anybody know what Nabal means in Hebrew? His mother named him “Fool,” and he didn’t want to let her down! Nabal insulted David and his men. What should David have done? I think, he should have walked away from this one. But David got hot-headed himself, saddled up his horses to go show Nabal a lesson, and it took the wisdom of Abigail to diffuse the situation. If she hadn’t intervened, David would have become a Nabal himself. And some of us love that answer! Why? Because we don’t want to talk with a fool. It’s like mud wrestling with a pig. You both get really dirty, and the pig enjoys the whole thing! Sometimes, we’ve got to say something! V.5 says that if we don’t, then it looks like there is no answer for what the fool is saying. The puritan Charles Bridges writes about this verse, “Silence may sometimes be mistaken for defeat. Unanswered words may be deemed unanswerable, and the fool become arrogant, more and more wise in his own eyes” (577-576). So, sometimes, we have to say something to pop a fool’s bubble. The Apostle Paul did this really well. And what he’s doing there is using his opponents’ own line of reasoning and then showing how foolish their conclusions really are. Sometimes, we have to take the battle to them and play on their own turf–even if we play by our own rules. Do we ANSWER or NOT ANSWER? Most of us are prone to one or the other. Some of us love to argue. And we want to point out the problem with the other guy’s thinking. I read a lot of blogs. And that’s a common kind of thing that shows up on blogs. Lots of pointing out what’s wrong with someone else’s position. And sometimes, that’s needed. But the problem is that we might become a fool ourselves. Many of the rest of us, I imagine, are prone to not give an answer. To just be quiet and walk away. Afraid of a fight instead of itching for one. And sometimes that’s needed. But the problem with that approach is that the foolishness can go unchecked. Imagine if every parent left their children to remain in their foolishness. Some children grow up thinking that they know it all. Because their parents didn’t love them enough to answer their folly. “That situation poses a problem to the wise: how should one ‘answer’ the fool? The opposite bits of advice—‘do not answer’ and “do answer’—show that there is no automatic formula to be applied. Each situation calls for a response that the wise must have confidence to discern on the spot. In one case, to answer would lead to prolonged argument in which the wise might be trapped into babbling like a fool. Where there is a chance of that, silence is the prudent way…In another case, one prick of the fool’s balloon may bring him back to reality and burst the bubble of his conceit (‘wise in his own eyes’). To answer in that circumstance does a favor to everyone, including the fool…both proverbs are valid, each in its own setting,” D. Hubbard, Mastering the Old Testament: Proverbs (Word 1989), 398-99. You know who was awesome at this? He encountered a lot of foolishness in His ministry. From Pharisees to Disciples to Kings. And He never made the mistake of playing the fool-game back to the fool. He didn’t even give an answer to King Herod when he was asked a stupid question. He asked questions sometimes to change the rules. But He didn’t miss a chance to point out someone’s folly so that they couldn’t think that they had confounded Him in all of His wisdom. Jesus was perfect at this. And we can learn a lot from His example. Do not answer a fool according to his folly. Both, properly understood, are right and true. Let’s think how that might play out in our 3 fer’instances. In our family, my brother is famous for saying in frustration to an atheist teenager back when he was in high school, “Have fun in Hell!” We call that the Andy Mitchell School of Evangelism. You don’t want to go there. But should you say nothing? Kids, could you say something like that? The Lord will help you to. Don’t Answer a Fool According to His Folly, But Answer a Fool According to His Folly! Guys around the water-cooler at work. Maybe you just let that one go. There’ll be another time. And you just let that sit there. If you don’t say anything, they might think they’ve got you. Ladies, you’re caught in between the boyfriend who wants the abortion and the girlfriend who wants your opinion. You don’t get bent out of shape. You don’t start ranting and raving or threatening to blow up an abortion clinic. That would be becoming a fool yourself. But you’ve got to say something! Can I recommend a book for everyone to read? If you don’t know what to say about pro-abortion arguments, you need to read Randy Alcorn’s book, ProLIFE Answers to ProCHOICE Arguments. And we can’t be silent on this issue in our culture! It’s too important! It’s a matter of life or death! I know that it’s a lot easier for me to throw out hypothetical foolish attacks and then give you crafted wise answers than it will be to answer fools in real life. But God will give us the grace to answer folly where we need to, if we trust Him. Because God has supplied, in Jesus, the greatest answer to folly there ever could be! Jesus died for our foolishness. He paid the penalty in His body on the Cross for all of our rejecting God’s truth. And then He came back to life to give us Himself and His wisdom. The book of Colossians says that in Him are all the treasures of wisdom and knowledge. If we have come to trust in Christ alone, we have free access to all of the wisdom we will ever need–for all eternity! Don’t Answer a Fool According to His Folly, But Answer a Fool According to His Folly–and Jesus will help you to do it. This is a man with too much time on his hands, but at least he uses it creatively! Dan Ledford begins his new series, answering questions from his flock, from the Bible. Matt's Messages - In Christ, A New Creation! In just a few minutes, we’re going to be baptizing 5 people as a declaration of their faith in Jesus Christ. But first, I’d like for us to chew together on a morsel of holy Scripture that I think communicates in one sentence a lot of what baptism signifies. Water baptism is a picture. It is an outward symbol of an inner reality. I often liken it to a wedding ring. This gold band on my finger does not make me married to Heather Joy. My covenantal relationship with Heather Joy makes me married to her (Praise the Lord! ), and this ring symbolizes our marriage to the watching world. Water baptism is a symbol, as well. But what does it symbolize? A number of things, too many to include in a short baptismal devotion, but I’d like to draw your attention to at least two in 2 Corinthians 5:17. Now, you can tell from the word “therefore” that this verse is part of a larger context, a larger argument. Paul is actually talking about ministry in this section. And this verse fits into that larger argument as an explanation of how Paul goes about his ministry. But we don’t have time this morning to develop the larger argument. We’ll save that for another day. Here we’re just going to look at this one sentence and see what it tells us about being a Christian (and therefore what Christian baptism signifies). First, water baptism signifies being “IN CHRIST.” In Christ. “In Christ” is the Apostle Paul’s shorthand description of being identified with Christ. Our position in Christ, the benefits and blessings of being in Christ, the inclusion we have in Christ’s righteousness, Christ’s standing with the Father, Christ’s holiness, and so forth. ...Are you in Christ? Have you been joined to Jesus Christ by faith? Have you trusted in Jesus Christ alone for the forgiveness of your sins and the gaining of eternal life? Are you in vital union with Jesus Christ? Are you “in Christ?” There is no more important question to have answered! These Nathan, Lucas, Emigh, Abbi, and Kay have come to believe the Gospel of Jesus Christ and are now “in Christ.” And proclaiming it in their baptisms. If you are in Christ, have you symbolized that by baptism? That’s what water baptism pictures. Going down in the water symbolizes your union with Christ in His death and burial. Coming up out of the water symbolizes your union with Christ in His resurrection. In a Real Christian, God has done a new work of creation! Just as He created everything we see and feel and touch and smell in this creation, He has also done a work of New Creation–He has brought about a decisive change inside of the new Christian. We often call that new work of creation: Regeneration. Being “born again.” Being given new spiritual life, a new heart, a new life. Now, that almost sounds like a new Christian is not at all like they used to be. They are perfect, they never sin, they have arrived, the old has gone[! ], the new has come[!]. If that’s true, then none of these 5 to be baptized are ready yet, because they are not perfect yet. And neither is their pastor! But I don’t think that’s what he’s saying. Paul knows that we are “simul justus et peccator.” Simultaneously righteous and sinful. He knows that we haven’t become perfect yet. That’s not what he’s saying. What Paul is saying is that something new has happened that is decisive for this person. Being “in Christ” means that God has started something dramatic and unstoppable in this person’s heart and made them a New Creation. And the Old Slave-Driver of Sin and the Old Required Allegiance to the Prince of this World are out in their penalty and position and power in our lives. And the new master of righteousness and allegiance to the true Lord of the universe have begun. God is the One who includes us IN CHRIST through faith. When...the time for baptism...arrived, the candidate would be called upon to renounce the Devil and all his pomp. Facing westward, the direction in which the sun went down, he would exclaim, ‘I renounce thee, O Satan, and all they works!’ Then he would deliberately spit three times in the direction of darkness, signifying a complete break with the power of evil and all their former claim on his life. Next, turning towards the sunrise, he would say, ‘And I embrace Thee, O Lord Jesus Christ!’ This would be followed by immersion... (The Mark of Jesus, pg. 33-34). Nathan, Lucas, Emigh, Abbi, and Kay are spitting in Satan’s face and symbolizing through their baptisms that they are in Christ, New Creations. One of my candidates for "wisest man on Earth" is David Powlison. And I don't say that lightly. This week, he had a guest post over at Justin Taylor's Between Two Worlds on the subject of New Year's Resolutions. Good stuff, as usual.